I've been interested in radio for well over a decade now and have broadcast on 4 radio stations during that time. Sadly I've now not been on air since October 1999 and am suffering withdrawal symptoms somewhat. I gained my first experience in broadcasting during the second year of my degree at the University of East Anglia, Norwich. 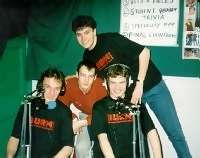 In October 1990, Livewire 945kHz (which has now upped its frequency to 1350kHz and can be heard online), UEA's student radio station was set up. After a week as a news presenter, I moved on to present "Root 'n' Branch", the weekly world/roots/folk show with Tom Knowland. We also co-hosted the weekly classical music show "Brahms 'n' Liszt". I also presented and produced parts of the "Livewire Pulse", the award winning weekly news show. The following academic year (1991-92), while I was studying at Miami University in the USA, I took on the post of weekday weatherman with Don Harman on WMSR, the local station. There I presented a daily weather bulletin which formed part of the evening news programme. I also co-presented the Saturday lunchtime show with Kelly Baumgartner, a mix of mainstream and indie tracks with a half-hour British music feature. Following my study year abroad I returned to Norwich for the final year of my degree and to Livewire - 945kHz again. During that year I presented the Tuesday and Thursday morning breakfast shows (8-10am), a lively mix of chart and recent hits, chat and information. I produced and presented my own local news bulletins and features. I was lucky enough in 1994 to make a demo tape with BBC Radio 1 when they were at Birmingham's NEC. The picture to the right shows me at the mixing desk. The demo involved 3 links and 3 tracks, one of which included the current No.1 of the time, 'Saturday Night' - one to remember! Over Christmas 1995 I did two overnight radio shows (1-6am!) on Pilgrim FM - 107.8FM, the only (truly) local station for Canterbury, Kent. It was an RSL (Restricted Service Licence) station which broadcasted easy listening music and local information 24 hours a day.